I saw a Pinterest post for Violet Beauregarde and thought i could adopt it to make a Pokeball. We inflated an exercise ball, covered it with three layers of paper mache, painted it, cut wholes for the head and hands. Lessons used or learned: 1. Leave a hole for the value of the exercise ball where your childs' legs will be. In other words you don't need to paper mache the whole thing. Also you want to deflate the exercise ball and take it out. 2. Plan to always have the project at the same temperature. We moved the ball from outside to inside. The ball expanded. The paper mache cracked. It sounded like an explosion 3. Cut the holes for the hands so the the trick or treat bad is easy to handle. 4. Leave time between layers of prayer mache for it to fully dry. 5. We did homemade paste with the cheap glue from the dollar store. I don't recommend the flour recipe. Some people thought it was a buoy. Could also be used to make a disco ball. 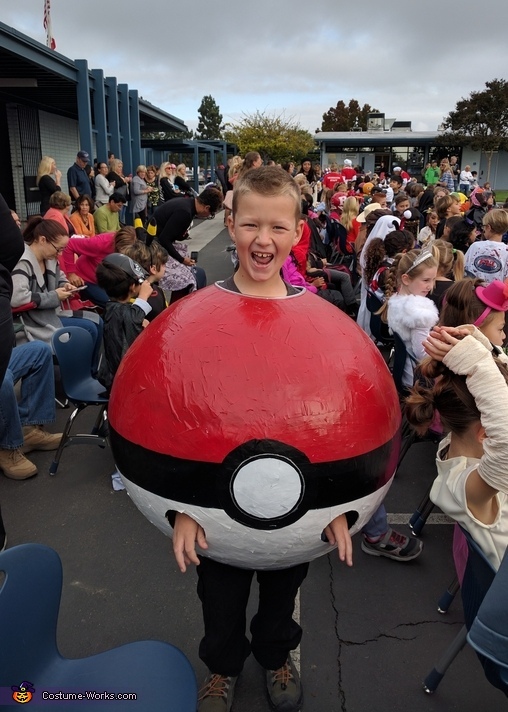 The 3D aspect really made it stand out in the Halloween Parade.